289,000 live websites are now using Magento, for serious eCommerce players that are looking for a solution which is scalable for over 100,000 products, Magento is the coherent solution. Why Choose Plosion Web Design? eCommerce platforms popularity, March 2017 (Ahead Works). 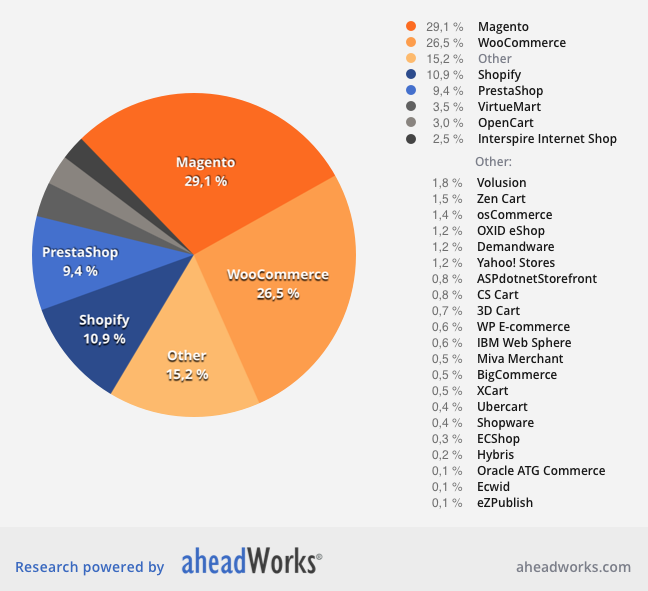 So What Exactly Makes The Magento Platform So Popular? Magento can seamlessly manage multiple eCommerce stores from the main CMS, managing invoices, payments, and shipping details all on one CMS. Ultimately helping to save labor resources. Magento boasts a huge amount of features, to include; email template creation, CMS full page editing (depending on theme designed), multiple currencies, discount configurations, grouping, special offer pricing, multiple payment gateways, shipping configurations, and a sizeable API. Magento EE has a pre-installed Secure Payment Bridge which complies with the PCI PA-DSS. Magento is built to be 100% scalable, as your product base grows so does Magento. Server upgrades and load balancers are all that is needed to cope with increasing high traffic as your store becomes more popular. Magento offers a solution that can process 80,000 orders per hour and is capable of hosting 500,000 products in one store. With a server response time of 100 milliseconds, compared to an industry standard of 2 seconds. The crucial element to choosing the Magento platform is its performance capabilities, to fall in line with your forecasted business growth. Is Magento The Correct Solution? Magento is a highly recognised open source platform which has been developed for the more serious eCommerce venture. If your required solution needs align with a 100% scalable platform, with the capabilities to host over 100,000 products, Magento is the correct technology solution. You can telephone us on +44 (0)7583 438835 or alternatively send an email via our contact page.